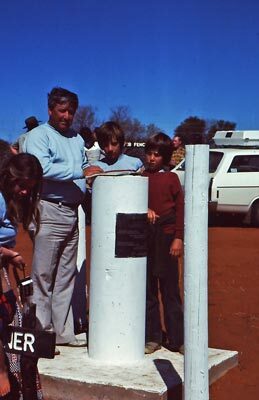 In the September 1978 school holidays, I set off with my father, John, my two brothers Stephen (14 years old) and Paul (12) for a nine day trip through Outback NSW. We were in my 1977 Holden Gemini sedan. We had a roof rack with lots on top (including a table), two small tents packed, a stack of frozen meat and ice in an esky and a few cooking implements. As you can imagine, it was pretty squashed but luckily Stephen and Paul were small. 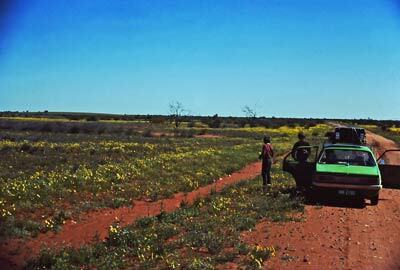 We left Sydney and drove to Bourke. We refuelled at Wellington and Nyngan and then Bourke. We stayed with Ranger Peter Rose. 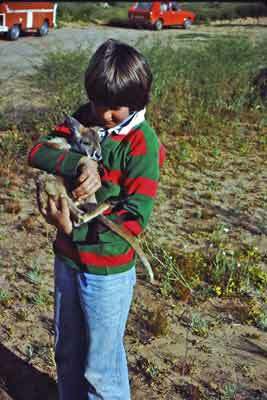 Peter worked for the NSW National Parks and Wildlife Service as did Dad and I. In fact, my father had been one of the Lands Department staff seconded over to set up NPWS back in early 1967, making him one of the very first staff members, working for it before it was legally established. 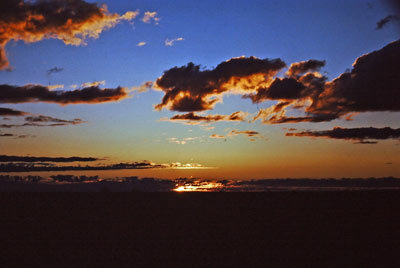 The next morning we left Bourke and headed west on the Wanaaring Road. This was not a very good road. 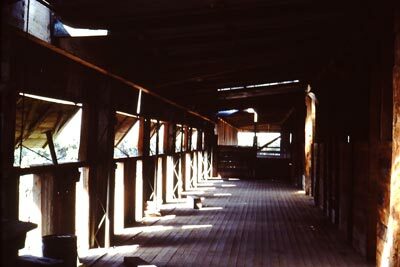 It was raised a few metres higher in the middle than the gutters along the side. In fact, it was so corrugated that for most of the trip we drove in the gutters on either the left or right side of the road as this was much smoother. We only passed one or two cars during the almost 200 kilometres trip to Wanaaring. It took a bit over three hours to do the trip. We refuelled at Wanaaring and had some lunch I think. I also had a tyre reapired that was gradually loosing air. 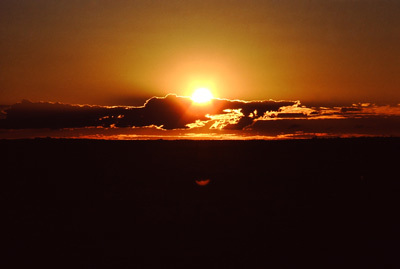 From there we headed west again, this time on the 230 kilometre drive to Tibooburra. About 125 kilometres out of Wanaaring we came to a giant lake. Well, so what, you might say. It just happened that this lake was covering the road. It stretched as far as we could see. There was no way that we where going to go any further on this road. Why did not Peter or the NPWS District Manager in Tibooburra warn us of this as it was obviously a known blockage? 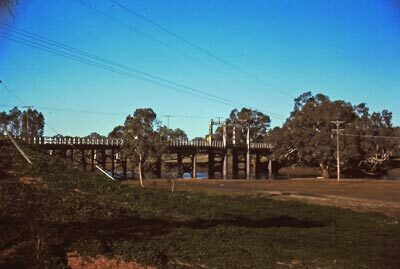 The lake was in fact the Bulloo River Overflow and the water was still remaining from the huge floods of 1974. 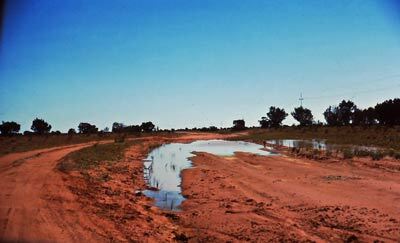 Note that in 2003 when I travelled this road to and from Tibooburra, this section of road now skirts the northern edge of the normally dry lake. There is also another huge diversion now around another lake to the west. I consulted my very rough country map and saw that there was some sort of road that went in a loop to the left that may get us around the lake. We went back a bit and then saw a small sign on the (now) right that said Tibooburra. This was pointing to the south, the opposite direction to where it really lay. This was through a property called Salisbury Downs. Off we went. I should add that we had not seen a single car since about 10 am, apart from those parked in Wanaaring. The track we were now following was certainly not a road, it was a series of two parallel wheel tracks that went over sand dune after sand dune. It was similar to the Rig Road across the Simpson Deseret that I did in 2003, except that the track was far less travelled than the Rig Road and the dunes nowhere near as high. For what seemed like ages we went up and down, left and right. It was now getting quite late in the afternoon and we were a bit worried. We were also going to travel a lot further than originally planned so I was a bit concerned about fuel (I may have had an extra 20 litres in a Jerry can but cannot remember). In one spot, when crossing a sand dune, I got bogged. As we could not let down the tyres to gain traction (of course we had no air compressor to reinflate), we had to dig and push etc. 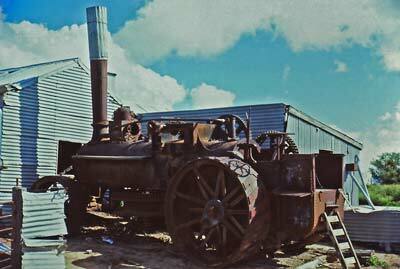 In fact, my brother Paul was put at the wheel of the car while the three of us pushed. Eventually we got out. Funny thing, even to this day, Paul does not drive. Did this turn him off it? There was only one sign for the whole way, at intersections I took the track that seemed most used. At one spot we came to a sign that said Tibooburra that actually pointed between the forks of a Y intersection. 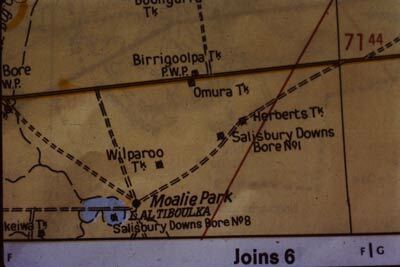 I took the left one, purely on the basis that Tibooburra was to the west and this one pointed more to the west. Some of the dunes were very soft and on a couple, I almost got bogged. After a couple of hours on this diversion (the total detour off the main road was about 90 kilometres from topographical maps that I recently looked at), we arrived back on the Milparinka to Wanaaring Road. Whew! From here we went to Milparinka (this was a relatively good road then - in 2003 it was closed) and then onto Tibooburra. We camped at the new Dead Horse Gully Camping Area just to the north of the town. 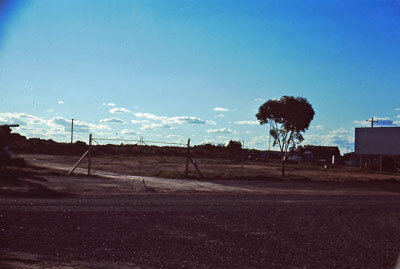 To get there you had to drive down the main runway of the NPWS airstrip (which was better than the main airstrip and used by all aircraft). The airstrip can still be seen today on Google Earth. An interesting thing is that the Dead Horse Gully Camping Area was on land owned by NPWS, but not part of Sturt National Park. This is because of objections from the NSW Mining Department (I think that is what it was called) as in the 1800s it was a gold mining area. In 2009 this area is still not officially part of the national park! For at least that first night there were dozens of cars there. This was because a guided trip being run by the RACV (Royal Auto Club of Victoria) was passing through on the way to at least Innamincka. There were at least 30 to 40 cars with one patrol car and another official vehicle. For the next few days we stayed at Dead Horse Gully, doing day trips to various parts of the Sturt National Park. 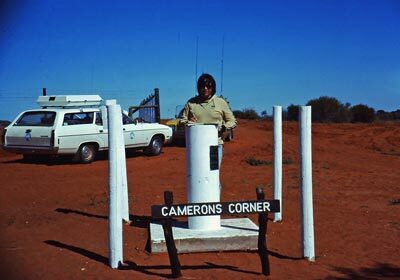 On one trip, we drove out to Camerons Corner (it was then always called Camerons - not Cameron like now). This was part of a NPWS run guided trip. They used CB radios to provide the commentary. I think I drove a then new Toyota LandCruiser Station Wagon 45 series out there. The road out the last few kilometres was new, only built the year before. 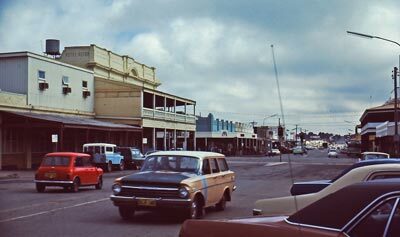 At Camerons Corner (and this is what it was called then, now is is Cameron Corner), my father pulled out a golf stick and a couple of balls and proceed to hit a golf ball from South Australia across New South Wales into Queensland. I am pretty sure that he was the first person ever to do this (and maybe still the only one - he did something similar again in 1981). If you ever come across some golf balls at this remote location, that is how they got there. 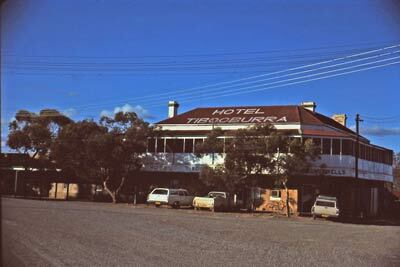 In Tibooburra we visited the two pubs (while Stephen and Paul had soft drinks outside - kids not allowed in any hotel in NSW back then). 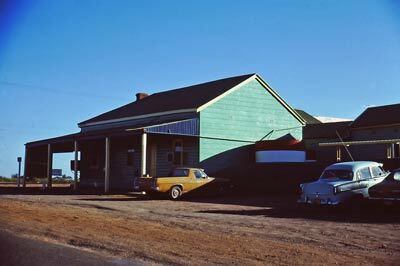 The sole shop in Tibooburra then sold only frozen things. Bread, milk and meat were all frozen solid, with deliveries to the town back then only once a week. The choice of things to buy was very poor. 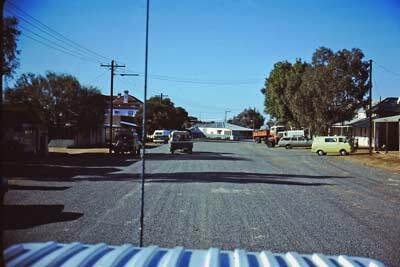 Believe it or not, there is a drive-in theatre in Tibooburra's main street. This is different to most (all?) other drive-in theatres in that once you drove in and parked you car, you either wound down your windows or got out of the car and listened to the sound track via speakers outside. In January 1980 I went to the drive-in and watched a film. We sat on the bonnet of our LandCruiser and drank beer that we had purchased from the nearby Family Hotel. This was, without any doubt, the most boring movie I have ever seen. It was called Moment by Moment and starred John Travolta and Lily Tomlin. I ended up walking out after about 30 minutes and went back to the pub to continue drinking. In 2010 Kelly and I drove into the drive-in. It is still there and used from what I understand. Anyway, back to the story about this trip. After a few days we headed south for the next part of the trip. 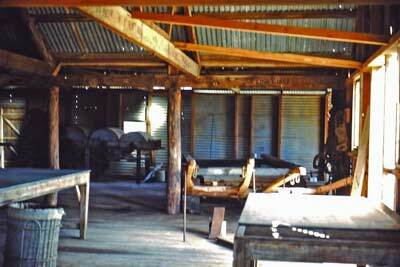 We planned to go to Mootwingee Historic Site (now called Mutawintji Historic Site but now not open to the public - Mutawintji National Park is open). We travelled down the Silver City Highway and stopped at Packsaddle for fuel (and snacks) and then took the White Cliffs Road. About 20 kilometres along this we took the road south to Mootwingee. As we got within a few kilometres of the entrance to Mootwingee, a huge storm hit. It poured rain, with probably an inch (25 mm) falling in less than 15 minutes. The road became a bog. The top of the road was a muddy slosh and my car was fishtailing badly. One moment I was looking sideways along the road out my window and the next out my father's window (out my window all I could see was where we had come from). It was hard left and then hard right on the steering wheel as I worked to keep us on the road. There was no way I was going to stop, at least we were moving forward. A kilometre or so along after it started raining we came across a Suzuki 4WD lying on its side. The occupants were scrambling out as we neared. I wound down the window and shouted to them "Do you need us to stop and help?" Thankfully they said no. As we moved away I saw them easily push it back upright. If they had said they needed help, I was not stopping here but at the top of a small hill about 300 metres away. At least there I might have had some chance to restart. Anyway, a few kilometres on we came to the entrance to Mootwingee. It was still pouring and the sky looked black as far as we could see. Dad and I made a quick decision to not stop and so we kept going towards Broken Hill. This was a wise decision as we later learned that it kept raining for a while and we would have been stuck there for about four days. When we arrived in Broken Hill about two hours later, the streets were awash with water. The storm had moved there and the enormously deep gutters were full to the brim. I discovered that in storms, they have wooden bridges that the shops put out across from the footpath to the roadway enabling people to cross the road. We visited the NPWS office and had then found some accommodation (I think we stayed in one of the hotels, but I cannot recall now. We had dinner with Greg Tucker and Barrie Booth from NPWS. This morning we got some more supplies and then headed out to Menindee and Kinchega National Park. We stopped at the hotel at Quongdong. 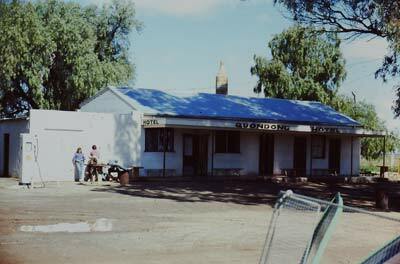 This was one of many pubs that used to exist on the roads out of Broken Hill. These were still in existence due to the arcane liquor licensing laws in NSW (and may have even been built solely for this reason). Pubs were generally not permitted to open on Sundays unless they catered for people who had travelled (from memory) 20 miles from home. 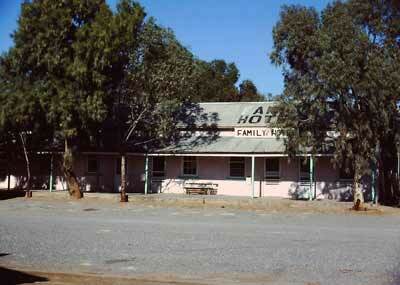 There were hotels at Stephens Creek to the north of Broken Hill as well as on the other roads. Even in Sydney, the Crossroads Hotel at Liverpool was huge on Sundays, as people from the main part of Sydney travelled there for a beer. 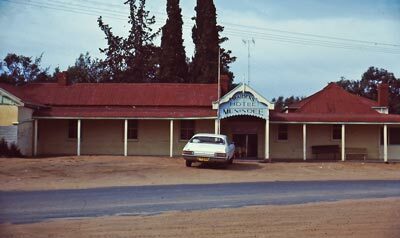 Therefore, on Sundays the miners from Broken Hill travelled out to these pubs for a beer. Of course, back then there was no random breath testing so people generally drove while drunk. Anyway, the pub at Quongdong was an amazing little hotel, so we stopped for a drink. 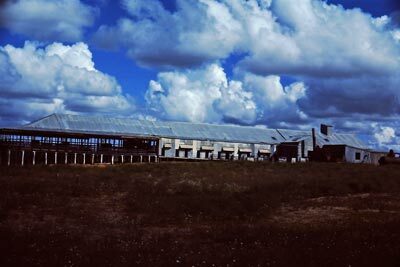 It was demolished at some time as it was not there in 2006 when I drove past. 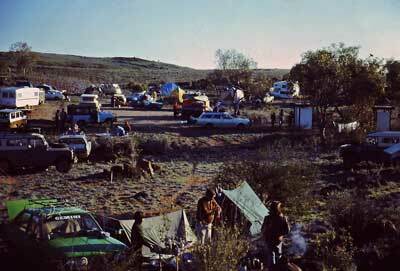 We arrived at Menindee and then went to Kinchega National Park and set up camp. It is over 30 years on as I write this and I do not actually recall where we camped. Peter Evans was the Ranger and we went out with him into the closed sections of the park. We may have even stayed at Peter's place. During the tours of Kinchega National Park I remember seeing huge numbers of kangaroos and emus. This was totally different to 2006 when at the height of the drought we only saw a couple of roos. 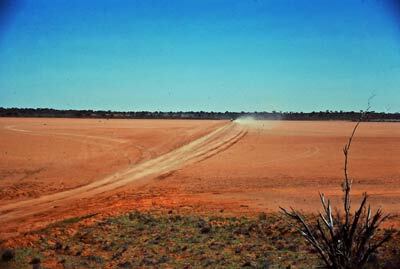 I think one day we used a little Suzuki 4WD (the two stroke ones) and drove out along the boundary. I certainly remember some stupid emus refusing to get out of the way and they just ran and ran and ran. 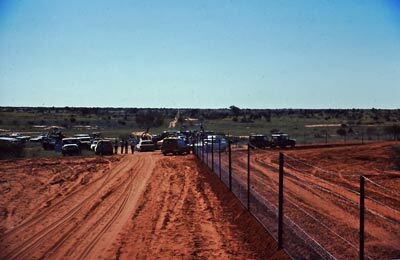 Every now and then, as they passed a larger fence post, they attempted to go "around" it only to bounce back off the rabbit proof fence (not sure if that is still there now). That little Zuk would have gone anywhere. 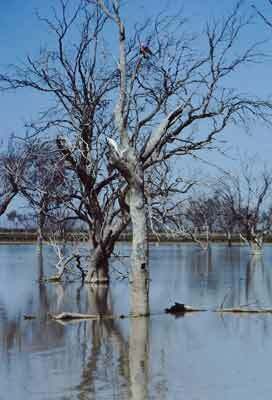 The Menindee Lakes were all full, with great views of the partly submerged dead trees. I took some great photos of the trees, especially at sunset. 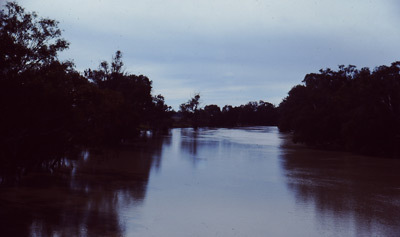 The Darling River was also full to the brim. When Kelly and I visited in 2006 it was not even flowing. After a couple of days here, we headed home. We left well before sunrise as Dad wanted to get home in the one day. We drove up the eastern side of the Darling River towards Wilcannia. 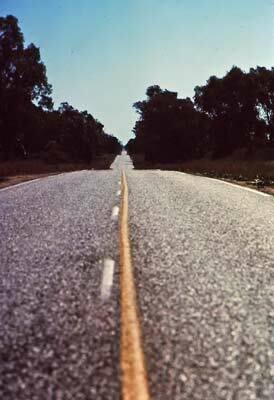 I remember that there were hundreds of rabbits on the road. We hit many as it was impossible to avoid them. You could hear them go "boing boing" as they bounced along the bottom of the car. After a long trip, we arrived back at Little Bay, having had a holiday that at that time, was nowhere near as common as it is now. This was a great adventure, even more so for my two brothers. 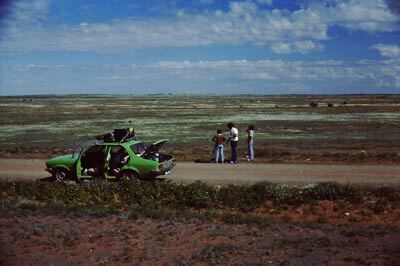 Back in 1978, very few people travelled out through this area, certainly not like the numbers of "grey nomads" and others in their far better set up four wheel drives (like I have now). Just shows that you do not need a four wheel drive to explore isolated parts of Australia, although it does help if you have a decent sized car!